... On a happier note, thanks for the awesome giveaway! it would be my grandmother. i was very close to her untill she died and i'd want to go back and spend time with her again, and tell her about my niece and everything that's happened in the 11 years since she left us. hands down! i've heard great things about HOURGLASS, so i'd love to win! I'd pick my mother. She died when I was 11 and since I can remember, she'd never been able to speak- just spell out what she's like to say. I'd like to speak with her and find out about her past. I can't actually ask anyone else: my grandmother gets too upset and my father doesn't like speaking about it. Since she only knew me when I was young, I'd love to tell her about my life: skills, friends, interests and hobbies. I'd also ask about my sister who my parents put up for adoption. They were too young at the time, and they didn't want an abortion. There's just so much my mum could tell me. The book sounds great, I love time-travel-type books. Thanks for the giveaway. I think I'd like someone from the future to come back and tell me what it's like in 2150. I'd like to compare notes with them: do they have anything still like internet, cars, mobiles? She can try out my mobile and see if hers has more options (if she has anything comparable). I think I would bring back Joan of Arc. She was so fierce and had such an interesting life. I would want to know everything about it. Thanks for the giveaway! I can't wait to read this book. I'm so excited about this book, I can't wait to read it! The time travel question is a really good one but hard. I guess I would like to meet my paternal grandfather. He died before I was born and my father always said he wished his dad could have seen me. I would bring back my grandfather. He died suddenly and I didn't have a chance to say goodbye. I would tell him how much he means to me, how wonderful he is and I would let him know he has multiple great-grandchildren (he never got to meet any of them!). What a great giveaway! If I could bring anyone back, I would want to bring back my mother's parents. They died two minutes apart when I was 8. I didn't get to spend nearly enough time with them and would love for them to see the person I am today and see how well I am doing. I suppose it would be really interesting to meet my great-great grandmother and talk about why and how she moved from the old-country to Canada. I could tell her how much easier life will be for her grandchildren. I'd love to read HOURGLASS! I love this question, I always pick the same person. I would LOVE to bring back Marilyn Monroe. I would ask her about the Kennedys LOL! But I would also let her know how much she was loved, what an icon she became after her death. Its sad that people can be judged so badly when they are alive and then loved so much when they are gone. It's sad to know that she didn't really know how loved she was. I absolutely love the cover of this book! I have to admit its what caught my attention. Then reading what it was about just made me want to read it even more! I would totally bring my grandad back he died when I was three and so I don't remember him anymore but everyone always says how I was the daughter he never had. Hey grandad just tell me everything you remember about the family??? because I want his memories to carry on to my children. I want one of my grandchildren or great-grandchildren to come from 100 years in the future and tell me what it's like! Of course they have to bring samples of their current technology to show me, and images (preferably video) of all my descendants. I'd love to talk to my late father-in-law. He and I never met--he died rather tragically in a car accident when my husband was 20. I'd love for him to know his only son is doing well, is loved, and is the greatest father to our little girls...and that he misses going through all of life's milestones without a dad. Even if he won't say so out loud. I would pick my grandparents, any. I never knew any of them. I think I would Cleopatra to come forward to find out what happened to her. I would tell her that in the future, she is a total rock star! Wow, what a lot of wonderful, heartfelt answers! It makes me realize that I would want to talk to my dad's parents, too, who died the year before I was born. I'd bring my Grandpa back, pre-Alzheimers, so he could meet my son and my husband and spend time with my Grandma again. I'm jnaomicline at gmail. Thanks for hosting the contest! My brother. He died when he was 20 and I was 3. I wasn't old enough to have a memory of him, but old enough to at least know he existed and miss the relationship we could of had. I'd just ask him simple things like what his interests were, if he generally had a happy life and to tell me every moments he could remember. Just something tangible to know and maybe we'd have something in common that I could think rubbed off on me because I saw him do it or like it. One memory like he gave me a cookie when Mom wouldn't. Something, even just one is better than nothing. I'd bring my Mom's father back so I could mmet him. He died before I was born. First, my birth father whose last contact with me was when I was a newborn; he died in 2008, just ten days before I hired a PI to find him for me. There are too many things I'd ask him to list here, but just looking into his eyes and getting a hug would probably be enough. Second, I'd want to meet my future self, from the day before I die (last coherent day). I'd ask my future self if I should change anything about my life. Which presents a conundrum because if I changed something, then my future self would be different and how would I know if that was the right change to have made? Can't wait to hear about your trip! And see pictures -- it's so gorgeous up there. Wow, what a tough question. I think I'd like to speak to either my Nana's little sister (she died in Holland during WWII) or my Nana's cousin who worked in the Resistance movement during the war. I'd like to hear firsthand from them what it was like. Beyond personal history, I think it would be awesome to talk to someone from Medieval Europe... like Heloise and Abelard. Maybe one of the Saints, like Francis of Assisi or someone. This might be self absorbed lol, but I would love to meet myself in the future if that is an option. I'd probably just ask and talk about the standard stuff: what I'm doing in the future, what I should/shouldn't do, did I ever get that hedgehog and named it Penelope. These answers are amazing and intense! (((hugs))) to everyone, especially those who've lost loved ones. I think I'd have to pick my grandfathers - together. Grandpa G saved Grandpa P's life, but Grandpa G died before my mom and dad met and got married. I think I would bring back my great-grandmother she raised my mom and my mom always talks about the wonderful food she used to make. I would ask her for some of her recipes because my mom is always trying to figure out how she made certain things. I would bring back Wilma Rudolph. She is this really big track&field star. I would ask her for some advice. I would tell her that nothing has really changed since she died, but the internet has gotten really popular. I would love to help with my cousin and intervene with his life, go back 6+ years and help to be a more positive influence in his life before he made a really bad final decision. thanks for the giveaway Jeri! I would bring my mom back just long enough to tell her I love her, miss her, and look forward to the day we will be able to hang out again. Until then, I will make sure her grandchildren remember how wonderful she is! As always Jeri, you ROCK! I would bring back my grandmother. I was very close to her but before she died, I didn't have a chance to say goodbye. I want this book so bad! I would have to go with Marie Antoinette, I find her super fascinating . I would ask her about her clothes and all the things she did. Wow. This is going to be uber personal but if I could bring one person back it would be my husband's great grandmother. When she died 3 years ago, she told her son (husband's grandfather) a secret of hers but she was no longer in her right mind and none of us are sure whether to believe it all so she has started a family mystery and I want to solve it. I have to say, this is a very simple question for me. my aunt died young of cancer when i was little and the one thing that has bothered me all my life is that i didnt know much about her. so i would want to talk to her. i would ask her everything. her favorite color to her favorite memory: as many questions as i could ask in the time we had together. i would tell her all about our family in the present. that her 3 little kids are doing great, that her husband is ok now, that everything is just alright. I'd want to meet, talk with Michael Turner (comic book creator/artist) and I would just love to ask him about his works, and how much they mean to me, and how he has made me into such a comic book clooector, I'd also let him know how amazing his company is doing now, and that even after his death he is still loved and remembeered by all his fans. I would like to say that I would let the past be the past. I don't think it's a good idea for me to contact people from the past. thanks for the giveaway! 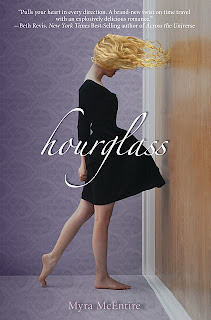 I can't wait to read HOURGLASS, and would *love* to win a copy! I would bring back Leonardo DaVinci. We would ride on a plane and make phone calls to each other. I'd show him Facebook and blogging. I have a feeling he wouldn't be very surprised, just impressed, and curious as to the mechanics of it all. I'm not really sure who I'd bring back. Maybe someone like Cleopatra, just because it'd be cool. I would love to talk to some random (but nice) person from the future just to find out a bit about what happens. Thanks to everyone who entered and shared their heartfelt wishes. I admit I got choked up a few times. I promise if you check out HOURGLASS when it comes out next month, you won't be disappointed!